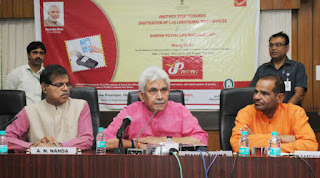 The DARPAN (DIGITAL ADVANCEMENT OF RURAL POST OFFICE FOR A NEW INDIA) project was launched by the Department of Posts. This app launched under the DARPAN project, will help in collection of premium of these two policies at branch post offices anywhere in India, with online updation of the policies. The acronym DARPAN stands for “DIGITAL ADVANCEMENT OF RURAL POST OFFICE FOR A NEW INDIA”. The project was launched by the Department of Posts. It was launched to achieve total digitisation of postal operations in the country, under IT Modernisation Plan, Department of Posts (DoP). It aims to connect all 1.29 lakh Rural Branch Post Offices in the country, to enable them to do online Postal and Financial Transactions. Under it, hand held devices with SIM connectivity and solar power backup are installed in all Branch Post Offices across the country to ensure improvement in quality of Postal services being offered in remote rural areas. With launch of this app, indexing of maturity claims of PLI and RPLI polices can be done at Branch Post Office itself, upon which insurant will immediately be provided with request number for further references. This will help in providing better after-sales service to customers of PLI and RPLI, particularly those living in rural areas of country. The project seeks to increase rural reach of Department of Posts (DoP) and enable BOs to increase traffic of all financial remittances, savings accounts, RPLI policy and cash certificates. It also will improve mail operations processes by allowing for automated booking and delivery of account. This project will help to improve quality of service, add value to services and achieve financial inclusion of un-banked rural population. Customers in these areas can now avail the facility of online Core Banking, booking of Registered and Speed Post articles, booking of Money Orders, deposit of Postal Life Insurance and Rural Postal Life Insurance premium through these hand-held devices.